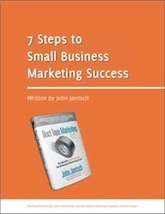 Download our FREE Ebooks with up-to-date marketing strategies. We’ll also send you Strategic Marketing Tips whenever we share brand new marketing content! Most people don’t think of marketing as a “system”. But I’d like to challenge you to start thinking of marketing as one of the most important systems in your business. 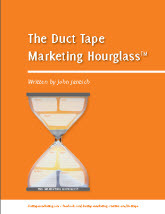 This Ebook contains the 7 core steps that make up the simple, effective, and affordable Duct Tape Marketing System. In this Ebook, you’ll learn how to develop the 7 touchpoints in order to complete the Hourglass for your business, content, product launches and campaigns. I don’t care what your business sells — your total online presence is the key to your success. 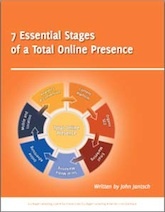 In this Ebook you’ll learn the key components needed to build your Total Online Presence including specific details and action items for each stage. Small businesses simply don’t have the budgets these days for expensive advertising and elaborate marketing campaigns. 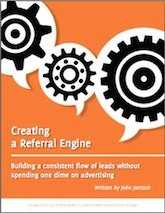 They’re relying more than ever on word-of-mouth referrals. This Ebook will show you how to create your referral strategy that compels your clients and partners to create a buzz about your business.